The Califone 3060AV stereo headphone are perfect for today's classrooms, computer labs, and libraries. 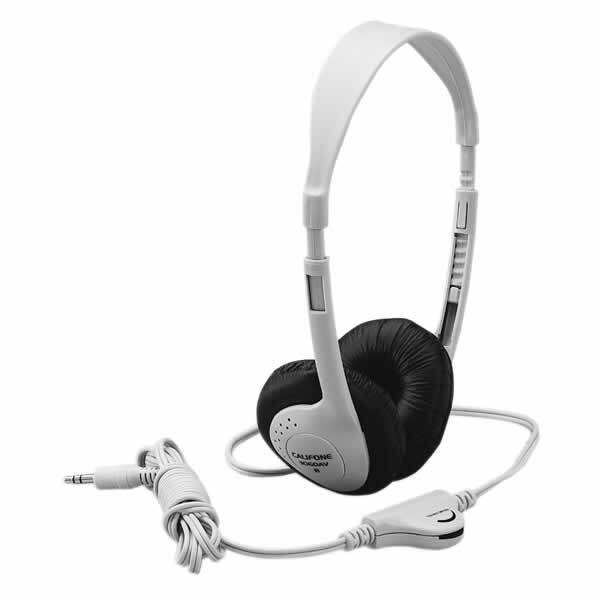 These headphones feature a fully-adjustable headband, ambient noise reducing earcups, and an durable, reinforced 3.5mm mini cord that connects to media players and computers. The permanently attached 3.5mm cord with in-line volume control lets each student listen at their own volume preference. The 8ft straight cord resists tangling with other cords, is long enough to reach the rear of a computer, and has reinforced connections to resist accidental pull-out. Comfortable leatherette ear cushions ensure long-lasting comfort throughout the school day.